Telephone service in the Waldron area is believed to have begun in the early 1900's possibly as early as 1904 through the early efforts of area residents. On March 31, 1913 a Memorandum of contract listed the owners and operators of Waldron Telephone Company to be Guy Smith, Carl Case, E. F. Conner and A. A. Kalder. The company was purchased and turned over to John R. Fox on Sept. 1, 1946. At that time the outside plant was in very poor condition. Most of the poles were broken down and the telephone lines were lying on the ground. Outside plant repairs began immediately. On June 28, 1971 a new project for Waldron Telephone Company begun. The company was granted a Rural Electrification Administration loan for the project would include 100% buried service cable drop, construction of a new central office building, and an all new Stromberg Carlson switch. John R Fox president and manager of Waldron Telephone Company passed away on May 26, 1982. He had married Kathryn J. Yeagley on May 29, 1947. Upon her husbands death Kathryn took over ownership and management of the company. A Northern Telecom DMS-10 digital switch was cut into service on August 25, 1990. This upgrade brought Equal Access Service and Custom Calling Features to Waldron area residents. In the early 1990’s, the Company entered into a partnership(Cass Cellular) with Century Cellunet (now part of Alltel) to provide cellular telephone services in Rural Service Area 9 (which covers the southern tier of counties in Michigan and includes the Company’s service area). August 31, 1994 was the connection date of two A-links, circuits which connected Waldron Telephone Company to Ameritech. With this connection Waldron Telephone Company upgraded its switch to a Signaling Systems 7 network which enabled the company to offer Class Calling Features such as calling number delivery, automatic recall, and selective call rejection to name a few. On November 14, 1995, Fox Communications was formed to provide a more flexible structure for participating in the business opportunities arising from deregulation and technological advances both within and beyond the Company’s exchange area. It was at that time Waldron Telephone Company became a wholly owned subsidiary of Fox Communications Company. December 1995 Cass Internet, L.L.C. was formed with three other local telecommunications companies in southern Michigan to provide internet services under the name Cassnet. By 2002, this company had approximately 2,089 subscribers. On July 14 1998, Fox Communications formed a new subsidiary. This new company, Waldron Communication Company, is reselling toll through Great Lakes Comnet Incorporated, of which Fox Communications Company is a shareholder. December 16, 2002 Waldron Telephone Company broke ground for new office building to be located at 115 South Main Street. Geotech, Inc. was the architects and Papenhagen Construction was the general contractor. The old business office remained in the Fox family. In January of 2004 Fox Communications sold its interest in Cass Internet in order to begin its own internet company operating under Waldron Communication Company. Waldron Communication Co. now offers highspeed internet through DSL, Wireless & WildBlue Satellite service plus also offers DIRECTV Satellite service as well. April 18, 2004 Fox Communication’s President, Kathryn J. Fox passes away. December 2005 Fox Communications sells it interests in Cass Cellular to its remaining partners. 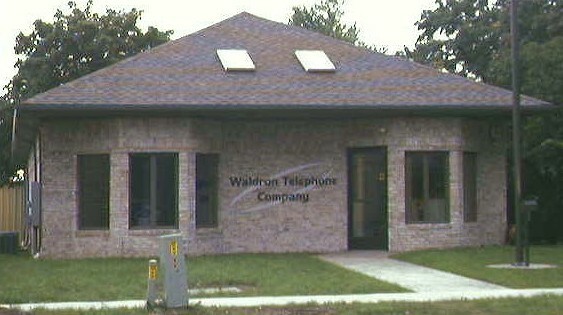 April 10, 2006 Waldron Telephone Company’s employees Mark & Lucinda Bernath purchase Waldron Communication Company and Waldron Telephone Company from Fox Communications and at that time Waldron Telephone Company became a wholly owned subsidiary of Waldron Communication Company.